We’re getting all set for a new brew all thanks to keen craft beer enthusiast Kevin Pratt. Kevin is a member of the Anglian Craft Brewers whose members have recently battled it out with their home brews to win the prize of seeing their beer scaled up to a commercial level and showcased at the Norwich Beer Festival. 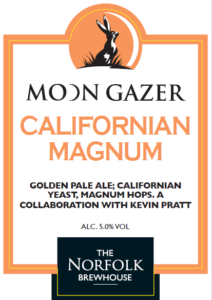 Having impressed the tasting panel with his 5% fruity, hoppy golden American Ale – called Californian Magnum – Kevin will be working with our brewer Bruce to take his brew into a full commercial brew. It’s a great opportunity for both brewers to collaborate and see how the recipe can be made to work at a scale 100s of times larger than the original brew. It’s also a bit of a challenge as both Bruce and Kevin are keen to replicate the brew which won the plaudits but also take the opportunity to see if it can be pushed that little bit further. The original recipe is delightful in its simplicity – as is often the case with great beers – less can be more – using a single malt and hop. The malt is Norfolk Maris Otter and as proud unofficial ambassadors of that malt that was – as you can imagine – music to our ears. However, we are going to make it extra special for Kevin by using floor malted No.19 Maris Otter. This is an extra special malted version of Maris Otter, and crafted just down the road from the brewery at Crisp Maltings, where it is floor malted in the traditional method used hundreds of years ago. The floor malting process imparts richer aroma and flavour, heightening Maris Otter’s natural character. We will also add just a hint of Dextrin just for a bit of added mouthfeel and head retention. As for the hops, Kevin’s beer uses Magnum. Originally grown in Germany, Magnum is fast becoming of the most widely grown high alpha varieties in America – hence Kevin’s Californian reference. The hop gives a very clean bitterness and subtle citrus-like flavours. Bruce will share his experience in the Moon Gazer brewing equipment as how the hop performs will vary quite a bit from Kevin’s home brew and so adjustments will be made to quantities and timings of the hop. Who knows on the brew day there may be a few more hop surprises on the brew day. The American theme continues with the yeast – as the guys will be using US S0 5 – to create a classic American clean malt and a crisp taste. So, look out for more news as we welcome Kevin to the brewery next week for the brew. It will then be available at Norwich Beer Festival and pubs from Monday 22nd October.